The bollywood famous Actress Sunny Leone has posted her picture in which you can see the cosmetic surgery on her face. In Fashion and Showbiz the cosmetic surgery is necessary. Now every actress has a cosmetic surgery to enhance the beauty of their faces. In bollywood from the famous Ayesha Takiya to Rakhi Sawant every actress has a cosmetic surgery to enhance their beauty. 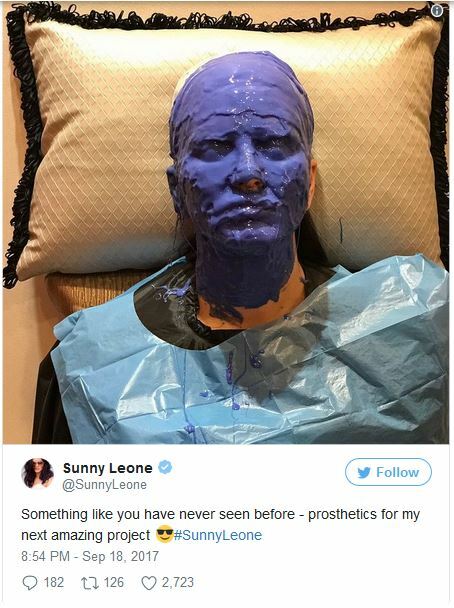 Now the bollywood item girl sunny Leone has posted a picture on twitter in which she has a prosthetic makeup on her face. Prosthetic makeup is a kind of cosmetic surgery. In which the bionic parts of body are placed on face and body through surgery. Through which the face of the person gets changed. According to Indian media Sunny Leone have used this prosthetic makeup for her new movie in which she is going to look completely changed. Sunny Leone has posted 2 pictures on twitter and has written that i have done this prosthetic makeup for my new movie and I believe that you guys haven’t seen me like this before. Sunny Leone has adopted this style only for her film and don’t have more information about this, she got the feedback on social media by the peoples. One person said that sunny Leone I like your old style and I don t like your new style. Whereas the other person said you are looking like a ghost are you playing a role of a ghost in your new film Ragni MMS. And one other person said you are looking like a mummy. This style of Sunny Leone is not permanent after the movie she will be back in her own face.